Braised chicken wing is definitively tasty stuff. Not to forget the drumsticks, in other words the more boney parts. Guaytiaw Pik Gai Sai Nampung is one of the best Thai food vendors in the Asok area, well known for their chicken wing soup (Gow Low Pik Gai) sprinkled with cowslip flowers (dok kachorn). The chicken wings are marinated in fish sauce, chili sauce and spices, and then braised. They also have a dry version that comes with a wing and a drumstick, some bean sprouts and shopped long beans. The soup is then served in a separate bowl. 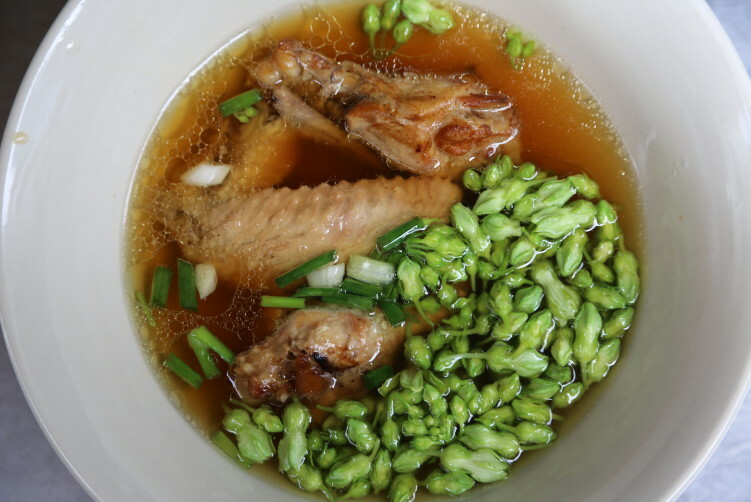 With or without broth, the chicken is tender and flavorful, with hints of honey. Different types of noodles are available to be added. Giam ee is a hand-rolled rice noodle that’s shorter and fatter and easier to eat than the sen lek and other noodles. It’s also known to hold better onto the seasonings. But personally I prefer sen lek noodles. But this is really a matter of taste. If you prefer other parts of the chicken, that is available too. Noodles in Bangkok is all about customization. 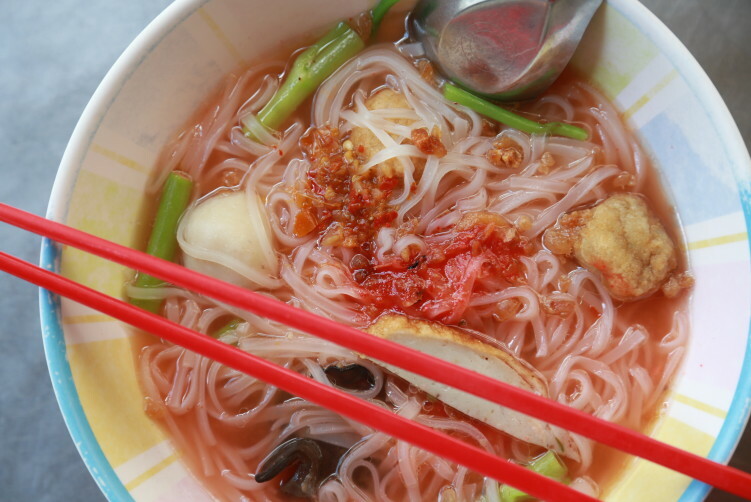 They also serve one of Bangkok’s best yen ta fo, the red seafood noodle soup with fish balls, tofu, pickled squid etc. Many doesn’t include this seafood soup as an obvious choice when ordering, but it really is a delicious dish when well made and served with home made fish balls as it’s done here. I use very little of the add-ons (sugar, chili, peanuts, vinegar, fish sauce) when coming here, sometimes a few drops of fish sauce (salt), sometimes a small spoon of peanuts to get the crunchy texture. The spiciness is normally excellent as it is. My best advice is to taste the soup before you start adding anything. 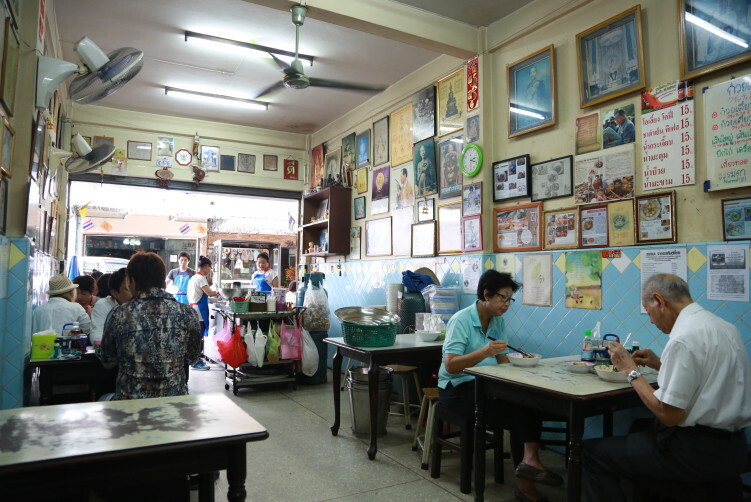 The interior is like many of the old timers in Bangkok, with walls covering photos of His Majesty the King, the family and newspaper clippings. The laminated table tops shows it’s age, something I find quite attracting. 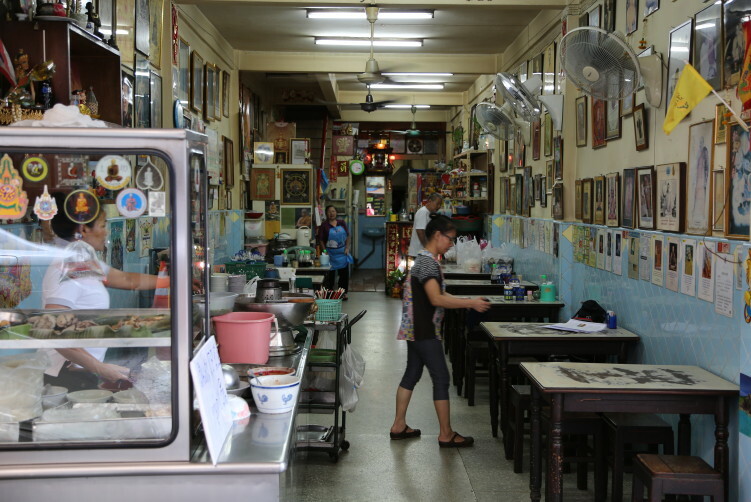 It’s basically an old school shophouse showing authenticity, and I have to add that it has worn it’s age well. It’s also sparkling clean. If you’re in for the chicken wing in broth, the rumor is that it runs out early and around 10am, but I have never experienced that myself. I have actually never been there later than 11.30am as I consider it more of a breakfast dish. 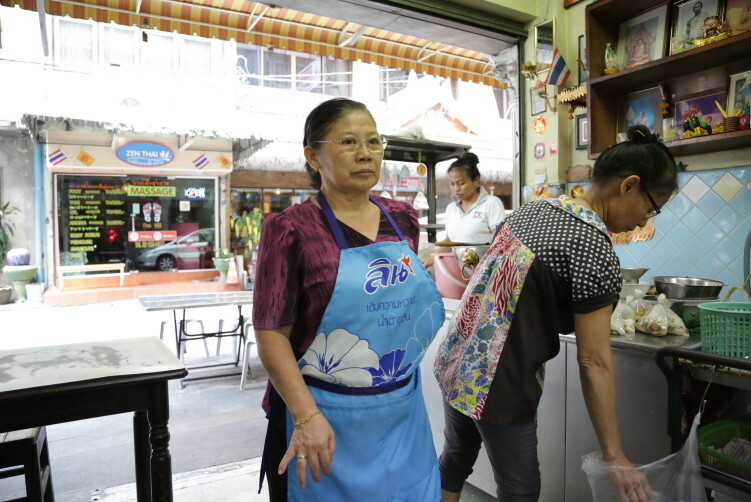 It closes rather early, 3.30pm, but I doubt you find a better breakfast or lunch vendor in the lower Sukhumvit area when it comes to soups, with or without noodles. 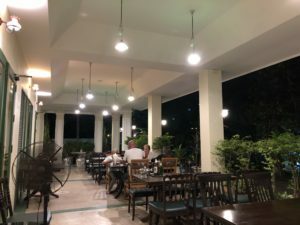 Lower Sukhumvit is really not filled with excellent street side option when it comes to Thai food. Guaythiew Pik Gai Sai Nampung is a real gem in this part of town. https://mysonginthenight.com/songwriting/ Open: Daily 9a.m.-3:30 p.m.
How to get there: Asok is nearest BTS station. Take the walkway to cross Ratchadapisek Road, go down to the street in front of the Exchange building, turn 180 degrees and continue towards the alley between Soi 18 and Soi 20 (opposite Radisson Blu on the other side of Sukhumvit road). It’s the fourth house on the right side, easy to spot, opposite a massage parlor. You will see one of the women cooking on the entrance to the shophouse. Braised chicken wing is definitively tasty stuff. Not to forget the drumsticks, in other words the more boney parts. Guaytiaw Pik Gai Sai Nampung is one of the best Thai food vendors in the Asok area, well known for their chicken wing soup (Gow Low Pik Gai) sprinkled with cowslip flowers (dok kachorn). They also have one of Bangkok's best Yen ta of (seafood noodle soup with fish balls, tofu, pickled squid etc).